24th St.Petersburg Summer Meeting in Mathematical Analysis and a Summer School for Young Scientists organized by St.Petersburg Department of Steklov Mathematical Institute in cooperation with the Chebyshev Laboratory of St.Petersburg State University, will be held from June 25 till June 30, 2015 at the Euler International Mathematical Institute (St.Petersburg, Pesochnaya naberezhnaya, 10). 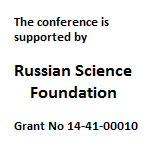 The conference is supported by the Russian Science Foundation grant 14-41-00010. Please, note that June 25 is the first work day of the conference, not the arrival day. Abstracts of courses planned at the School for Young Scientists are now available here. If you need a Russian visa, please fill in the visa form. The Institute will provide you with an invitation (*) needed for visa formalities. (*) A certain invitation authorized by a governmental institution will add 20 Euro per person to the registration fee, see below. (A visa invitation from the Steklov Institute of Mathematics sufficient for citizens of certain EU contries is provided for a lower processing cost of 10 Euro). Accommodation. The Euler Institute has a preliminary reservation at the Andersen hotel and the Nauka budget hotel. Please indicate your wish to have one of these hotels booked for you at registration. Please confirm the dates of your stay as soon as your flight dates are determined by e-mail zaleska@pdmi.ras.ru. If you wish to stay in a mini-hotel nearby the Euler International Institute please book it directly. More Information can be found here. Transport information will be given in the third announcement. Please, inform us about the means of transportation and arrival time as soon as this is available. Registration fee: None for the participants working in CIS-countries; otherwise, it is 50 Euro (plus the processing fee of 20 or 10 Euro in some cases, see (*) above). Accompanying persons: 20 or 10 Euro per person in some cases, in accordance with (*) above.